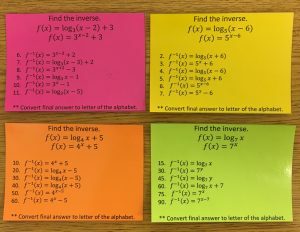 Inspired by this post from Sarah Carter and this post from Kim Hughey, we played Ornaments on a Tree to review for our rational expressions exam. I made two sets of trees (four trees per set). I put a point value on the back of each tree. I used 0 points, 2 points, 5 points, and -1 point. 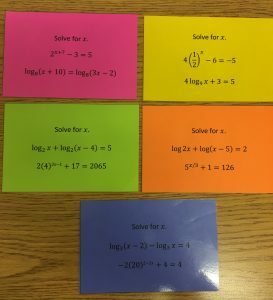 I also printed eight sets of problems (one per group) and put a colored sticker in the upper left corner. Then I laminated the trees and problems. 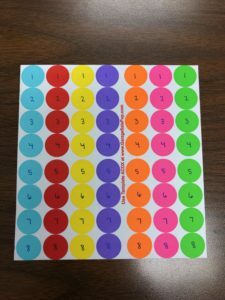 For each group, I wrote the numbers 1 – 8 on the colored stickers that would correspond to the group’s colored sticker. Before class, I randomly taped a set of trees to the whiteboard. I put my desks in groups of four and gave each group four dry-erase boards and markers, an eraser, and the set of problems. Each person in the group must work the same problem. When every member of the group had all their work shown and an answer, the group would raise their hand so I could check their work and answer. 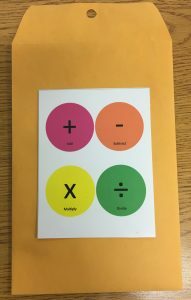 If the group’s work and answers were correct, the group received a sticker. The color of the sticker matched the color of the sticker on their set of problems, and the number on the sticker indicated the problem they had correctly simplified or solved. One member of the group would then place the sticker on any one of the trees (not knowing what the point values were for the trees). Groups could work the problems in any order. Since I had numbered the stickers, I was able to keep track of which problems each group had already worked. About 5 minutes before the end of the class, we stopped playing so that the points could be tallied. 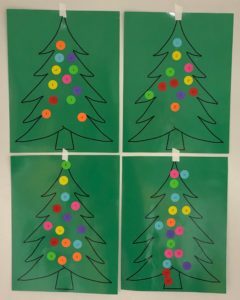 Each sticker on the tree for each group was multiplied by the number of points on the back of the tree. The group with the highest point total was the winner and received a star sticker. Since I had two sets of trees, I was able to run the game with back to back classes. In between classes, I removed the stickers from the previous class. This entry was posted in PAPA2 and tagged games on December 12, 2018 by Jennie Kelly. Last year I created a mini breakout on solving exponential and logarithmic equations. 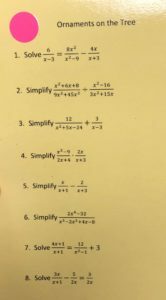 This year, the other Pre-AP Algebra 2 teacher at my school decided added to the breakout to include finding inverses of exponential and logarithmic equations. Pearland High School – population 2985 – has been infiltrated by zombies. It started with one zombie. In ten minutes, there were 25 zombies. After 15 minutes, there were 625 zombies. If this rate continues, the entire student body will be zombies in 30 minutes. But YOU can stop the zombie attack. The antidote is locked in this box! You have 30 minutes to decipher the codes and retrieve the antidote. It’s as simple as moving left, down, up, right! Can you break out in time to stop the zombies from taking over Pearland High School? I placed all three locks (directional, 4-digit, and 4-letter lock) on a hasp attached to one box. I projected and read the story to the class and asked each group to get an envelope with the clues from me. 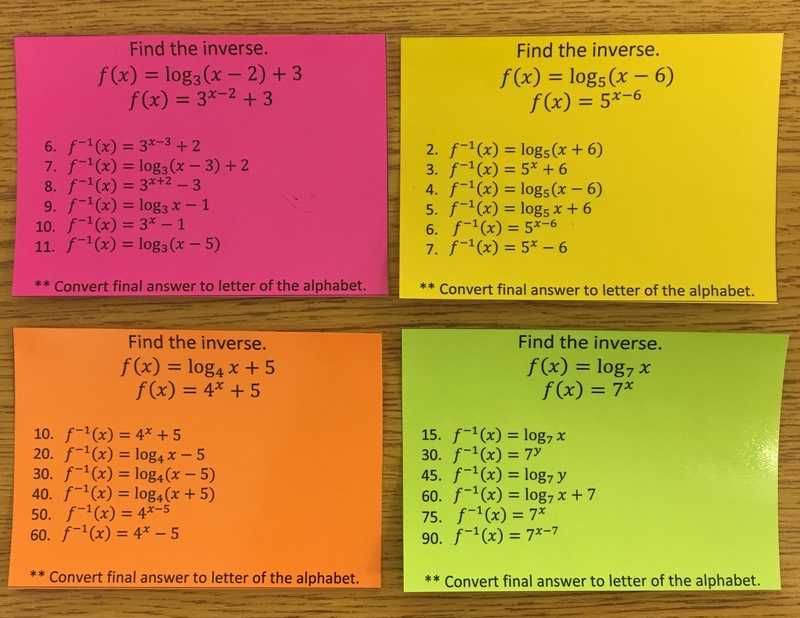 Several of the groups placed the envelope on an empty desk or up-side-down, so they did not notice the color clue that told them what to do with the solutions to the solving equations clues and inverses clues. As a hint for groups that requested one, I indicated that they needed to pay attention to the paper on the front of the envelope. The other teacher placed each lock on a separate box. She gave each group the story and the color clue that would be used with the other two sets of clues. The students had to open the directional lock to get the clues for the 4-digit lock. Then they had to open the 4-digit lock to get the clues for the 4-letter lock. Groups had 30 minutes to solve the clues to breakout and not become a Zombie. In my classes, 13 out of 22 groups became “Zombies.” However, with an additional 15 minutes, only 2 group were unable to successfully breakout. I believe the reason my students were less “successful” was because they did not know what to do with all the clues. Each group “divided and conquered” to solve the exponential and logarithmic equations and find the inverses, but they did not understand which cards went with each lock. I watched multiple groups switch cards with their teammates to have them check their work, so they had the right answers. In the other teacher’s class, the students were presented with one set of clues at a time. Once they had figured out what to do for the 4-digit lock, they were able to transfer that knowledge to decode the clues for the 4-letter lock. This entry was posted in PAPA2 and tagged BreakoutEDU, games on March 26, 2018 by Jennie Kelly. In March, I will be presenting “Breakout EDU with the TI-Nspire” at the Texas Instruments International Conference in Chicago, IL. 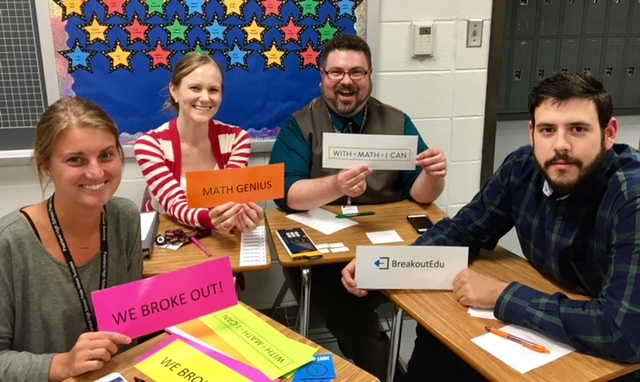 Breakout EDU brings the escape room experience to the classroom by creating ultra-engaging learning games for people of all ages. Games (Breakouts) teach teamwork, problem solving, critical thinking, and troubleshooting by presenting participants with challenges that ignite their natural drive to problem-solve. Participants will use the features of the TI-Nspire, including geometry tools, regressions, matrices, and sliders, to complete a series of challenges, reveal clues, and unlock mysteries in order to win the game. This session will begin with a short introduction, followed by playing the game, and will conclude with a short discussion about the game and how the activity can be used. I had my department test out my game at our department meeting today. Two of three groups were able to breakout. The group that did not breakout gave me some feedback regarding their troubles. I made a few changes to my presentation and clues that will hopefully allow all groups that participate in my session to successfully breakout. 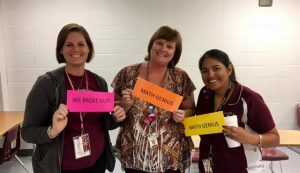 This entry was posted in Calculator and tagged BreakoutEDU, games on October 17, 2016 by Jennie Kelly. 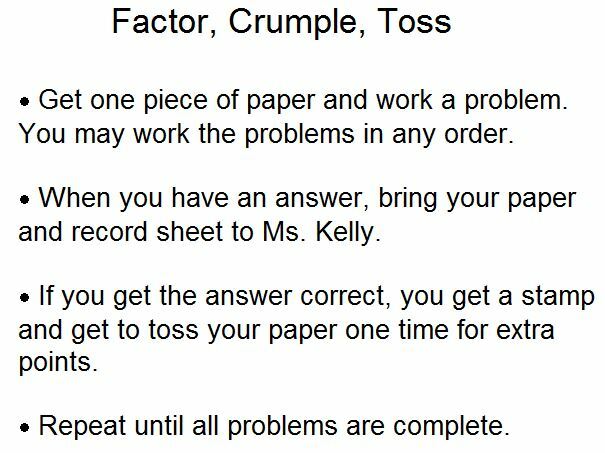 Inspired by this post from Kate Nowak, today, we played Factor, Crumple, Toss. I made a record sheet for each student. The only thing they were to write on this paper was their name. 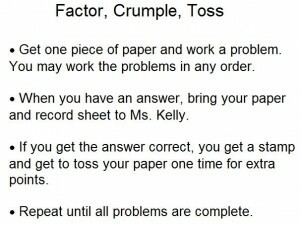 I also pre-cut several small sheets of paper for students to work the problems. I explained the directions and answered any questions the students had. Then I projected these problems. Originally I had moved all the desks to the perimeter of the room and had the extra point tossing area in the middle of the room. After 1st period, I made some changes to the room arrangement. I moved the extra point tossing area so that is was next to a wall. 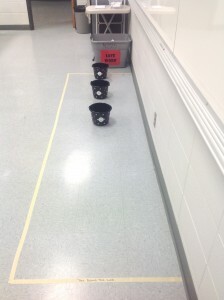 I did not want students walking through the tossing area while another student was trying to earn extra points. I also put some tape on the floor where students were to form a line to have their answers checked. I loved the student’s engagement. Not only were they working the problems, but they were encouraging each other as they attempted to get extra points. 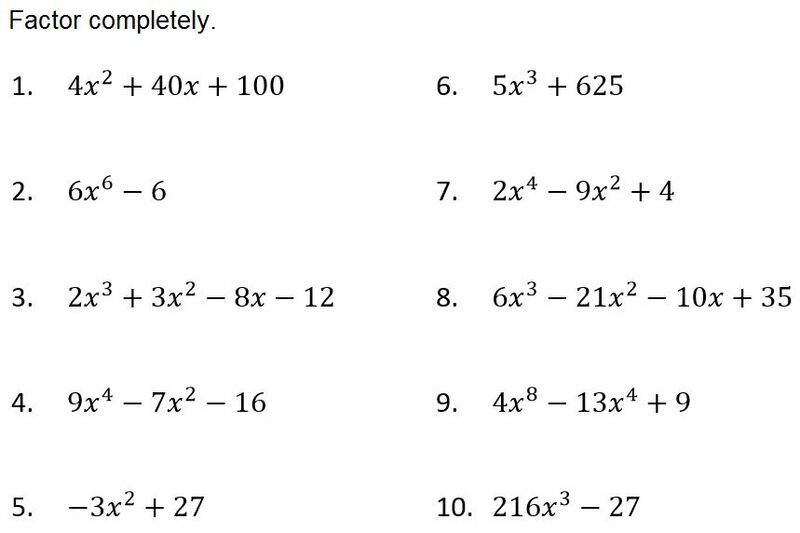 Although some students became frustrated when they did not get the correct answer to a problem multiple times, I think the activity was much better than having the students sit at their desks and complete a worksheet. 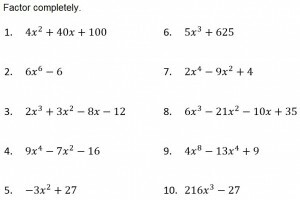 This entry was posted in PAPA2 and tagged factoring, games on November 11, 2015 by Jennie Kelly.